Update (April 17, 2019): The James River in LaMoure County is predicted to rise to 12ft by this weekend which is Action stage. This is due to rain events and slight increases from the Jamestown Dam. 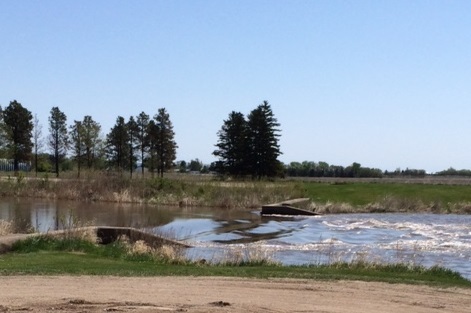 LaMoure County continues to see roads affected by overland and small creek and stream flooding. Please be aware of water covered roads in LaMoure County. Don't drive through flooded roads. Turn Around and find another road. For LaMoure County and Township road closures, you can login to the system (link below) using the username and password. The closed roads are marked with an E symbol. The flood stages of the James River at LaMoure are: Action Stage - 12 ft, Minor Flood stage - 14 ft, Moderate Flood stage - 16 ft, and Major Flood stage of the James River begins at 18 ft.
On April 4, 2019, the James River at LaMoure became the 6th highest crest with a level of 15.98 ft. The record at the LaMoure gage is 17.56 ft set on 04/15/2009. Watch the James River for hourly flow and levels at the gages near Adrian and LaMoure on U.S. Geological Survey website. For the Adrian gage, a maximum reading of 36.09 feet was recorded on April 14, 2009. In 2010, the maximum reading on the gage was 32.5 feet and in 2011, the Adrian gage highest reading was 31.13 feet. Hydrologic Outlook – Used to heighten awareness of possible flooding in the next severaldays. The flooding could be the result of snow melt, heavy rain, ice jams, or a combination ofthese. If you have property in a flood prone area you might want to start preparing! Flood Watch – Flooding is possible. It’s time to prepare! Flood Warning – Flooding is imminent or occurring. It’s time to act! Flooding can be caused by heavy rain, rapid snow melt, ice jams, and dam failure. It only takes 6 inches of fast-moving water to knock you off your feet. It only takes 2 feet of rushing water to carry away most vehicles. On average, floods kill more people in the U.S. each year than lightning or tornadoes.